Recently the New York Times reported that the US government had a secret program to investigate UFO sightings, one that was funded with 22 million dollars from 2007 to 2012. The Times story reported that the government study “produced documents that describe sightings of aircraft that seemed to move at very high velocities with no visible signs of propulsion, or that hovered with no apparent means of lift.” The New York Times also published on the same day a detailed account of a UFO sighting. They interviewed Navy pilot David Fravor, who was asked to use his Navy jet fighter to investigate an unidentified object in the sky. 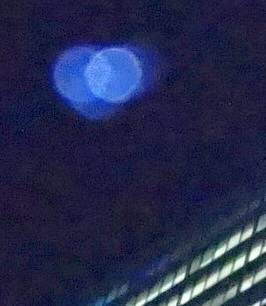 Fravor reported that the object “accelerated like nothing I've ever seen.” One of the Times stories included a video link showing a cockpit video of a UFO being chased by a fighter jet – an object with no apparent wings that had a strange aura. The object was speeding very high in the atmosphere. These revelations have provoked responses from the mainstream establishment, responses that have often been either misleading or empty-headed. An example is this article at livescience.com by Benjamin Radford. Radford presents an extremely biased account of UFO sightings, and claims that "UFO sightings so far provide no real evidence." This is pretty much the "total denial" tactic so beloved by skeptics, which simply involves claiming that there is no evidence no matter how high a mountain of evidence has piled up. Rather absurdly, Radford tries to discredit the recent government UFO research program by citing the Stargate government program into remote viewing (a program that produced dramatic evidence for this paranormal effect, as described here). He contradicts himself by claiming in one sentence that the Stargate program was "soon shut down," while stating in another sentence that it ran from "the 1970s through the mid-1990s." But you don't discredit one multi-year government program of paranormal investigation by citing another multi-year government program of paranormal investigation. One plus one equals two, not zero. SETI expert Andrew Siemion went on record arguing against UFOs on the basis that astronomers haven't seen them with their telescopes. That's a pretty dumb argument. The fact that some people have never observed something never discredits observations by reliable witnesses who have seen that thing. For example, I've never seen a bat in New York City, but that does nothing to discredit people who have seen bats in New York City. Another intellectually unimpressive response to the UFO revelations was one given by astronomer Neil deGrasse Tyson, who expressed a total lack of curiosity about the topic, saying, “Call me when you have a dinner invite from an alien.” Inconsistently, he states about some UFO, “"It's a flying object and we don't know what it is,” but also states, “The evidence is so paltry for aliens to visit Earth, I have no further interest.” But if we see flying objects in our skies we cannot identify, how could this be evidence “so paltry” for extraterrestrial visits? The evidence for UFOs is not at all paltry, consisting of decades of observations by a vast number of reliable witnesses. Tyson's statement of “no further interest” exemplifies a flaw in the attitude of modern scientists: they seem to have no interest in anything that is on their long list of taboo topics. The typical modern science PhD is a man of a hundred taboos, a man determined to suppress any intellectual curiosity he may have about a hundred anomalous phenomena he cannot explain. When such figures speak about the paranormal, they typically show no signs of having researched the topic they are speaking about. Perhaps the most clueless response to the UFO investigation appeared in a LiveScience story entitled, “The Truth About Those 'Alien Alloys' in the New York Times' UFO Story.” This story was published as the lead article on the Scientific American web site. Under Mr. Bigelow’s direction, the company modified buildings in Las Vegas for the storage of metal alloys and other materials that Mr. Elizondo and program contractors said had been recovered from unidentified aerial phenomena. Researchers also studied people who said they had experienced physical effects from encounters with the objects and examined them for any physiological changes. One of the authors of the Times report, Ralph Blumenthal, had this to say on MSNBC about the alloys: "They have, as we reported in the paper, some material from these objects that is being studied so that scientists can find what accounts for their amazing properties, this technology of these objects, whatever they are." When asked what the materials were, Blumenthal responded, "They don't know. They're studying it, but it's some kind of compound that they don't recognize." "I don't think it's plausible that there's any alloys that we can't identify," Richard Sachleben, a retired chemist and member of the American Chemical Society's panel of experts, told Live Science. "My opinion? That's quite impossible." This claim is nonsensical. Given the age of the universe, some 13 billion years, astronomers assume that extraterrestrial civilizations might be very many thousands or millions of years older than our civilization. So such a civilization that might have godlike powers could not create some compound that humans could not identify? That's hilarious. You might as well argue that scientists in ancient Greece could have identified any material or compound that we manufacture today. "These are all very standard techniques in research labs, so if we had such mysterious metals, you could take it to any university where research is done, and they could tell you what are the elements and something about the crystalline phase within a few hours," Nyman said. Sachleben agreed. "There are no alloys that are sitting in some warehouse that we cannot figure out what they are. In fact, it's pretty simple, and any reasonably good metallurgical grad student can do it for you," he said. Oh, really? So if there was an extraterrestrial civilization with science 2,000,000 years more advanced than ours, capable of using nano-technology to combine elements and rearrange matter in a trillion different ways we cannot imagine, using technologies we will not develop for eons, then anything they might produce could be quickly figured out by a grad student? I need not explain how stupid that claim is. What we see here is just a glaring example of the runaway egotism and knowledge over-estimation that is sadly not rare among modern scientists. Placing themselves and their colleagues on pedestals, many scientists portray themselves as great Lords of Knowledge who have mastered the universe's secrets. But the truth is they know very much less than they think they do, and that they have learned merely the tiniest fraction of the universe's secrets. Postscript: We have additional ignorant misinformation from the mainstream media in this article on Salon.com, which states the utter falsehood that "Historically, paranormal research has been done merely to keep pace with one’s enemies." Statements like this simply suggest that the author hasn't bothered to spend even a single afternoon researching the history of paranormal research. Then there's this backlash piece by astronomer Seth Shostak, who tries to suggest that witness testimony isn't useful for science, and that it "isn't terribly reliable in criminal court cases." But we all the time send people to prison for decades based on witness testimony. So if courts take witness testimony so seriously, why shouldn't science?